Which Philharmonic Offerings Made The New York Times, New York Magazine, NPR Best of 2014 Lists? Marino Formenti’s Liszt recital as part of the NY PHIL BIENNIAL, from June (New York Magazine and The New York Times, with Chief Music Critic Anthony Tommasini of the latter applauding “Alan Gilbert’s vision” and calling the biennial “a tremendous accomplishment.” But really, kudos go to our friends and partners at Great Performers at Lincoln Center for spearheading that intimate evening. And another offers a nice holiday gift idea! NPR Music’s Deceptive Cadence picked the CD of Nielsen’s Symphonies Nos. 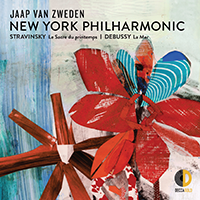 1 and 4, released in September, as one of the Best Classical Albums of 2014. All the media coverage on the retirement of Glenn Dicterow as our Concertmaster is giving us a look not only at the man, but an unusually candid peek into the job he’s held, magnificently, for 34 years. Yesterday's All Things Considered story in particular focused on the chair's role as diplomat and politician. A big part of his job, he said, has been to "make peace," Dicterow revealed, adding: "Everyone needs to get along to make gorgeous music. That's the bottom line." That was hard during the Orchestra's "cantankerous" years when he started, he said, recalling some "pushing and shoving matches." Now, with a more diverse roster that's more than half women, it's easier, he added. Good stuff. Follow the links above to hear/read more.